Reading my e-mail this morning I came across article of enlightenment from ‘Brain Pickings‘ the online magazine of astonishing information, literature, the arts and entertainment. In 1990 on this day Voyager I took a series of photographs from outside the Earths solar system distance of roughly 6 billion kilometers. Still operating today, March 2,2013 it was the brain child of Carl Sagan and his campaigning to capture a parting photograph of Earth. Voyager I was not expected to last much longer. 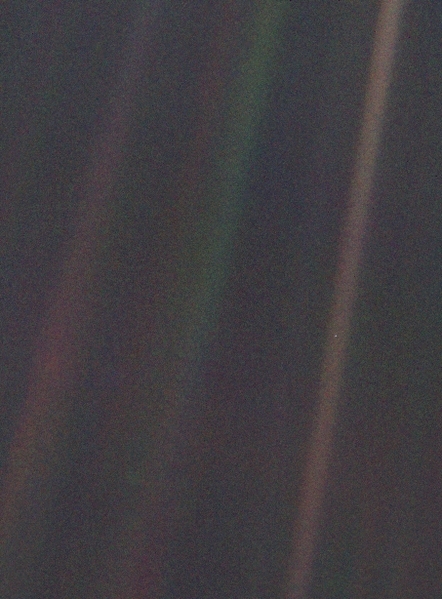 Below is the picture entitled ‘Pale Blue Dot’ as well as the philosophical and literary discourse Dr. Sagan gave to you and I.
William, you have outdone yourself here. I love this photo, the article and everything about it. Thank you. Thank you very much for putting it here. Love what Pen said there. As do many people, I have a list of those who would be better served in the vast reaches of outer space! It is the view, you know. Every thought word and deed are suspended on the sun-beam of a single star…..In the end I will remain humble!!! !